When it comes to purchasing a mattress there's several things you can do to make your experience an easy process. Listed below are a few things you can do before, and a few things to consider, before parting with your hard earned cash. You might have an idea of what style of mattress you set foot in a shop, whether it be a recommendation from a friend/family member, something similar to what you currently have, or even what to avoid - as everyone has different preferences. With a huge range of types of mattresses, from memory foam, traditional pocket spring, natural fill, latex, the list really does go on and on, its good to know a bit about how eah type can help you before you visit a shop, as it can save you getting overloaded with information on the day. Its best to try the mattresses before you buy, saving uncertainty after you purchase. When you pay a visit here at The Original Bed Warehouse we generally have 2 or 3 mattresses that would suit your requirements (if you have a rough idea of what you're looking for). We always recommend you lie on the mattress using your preffered sleeping position, and more importanly, TAKE YOUR TIME! Have a move around and try different positions to make sure you're happy with it. 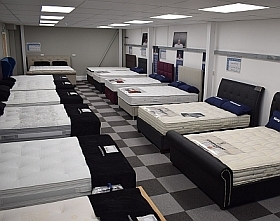 It's worth thinking of questions to ask yourself whilst trying mattresses across our showroom, does it feel too soft? Could it be firmer? Do you feel pressure anywhere? It's also important to bring your partner with you, if you share the bed. Don't visit at different times, to ensure you both like it and have enough space and to check if you feel each others movements or not. Whilst us at the Original Bed Warehouse like to be helpful, we realise it's an important decision, so once we've given the information we feel you require, we will leave you to it so you can try the mattress for as long as you want. Your local mattress and bed retailers providing outstanding savings to Bournemouth, Christchurch, Wareham, Swanage, Dorchester, Blandford, Wimborne and Poole!